Kael'thas Sunstrider is accompanied by his advisers as combat NPCs. * Conflagration – Randomly targets players within 30 yards; causes disorient effect with 600-900 damage per second plus 300 damage per second to all players within 8 yards of the debuffed player. Capernian will not attack players afflicted by conflagaration. * Nether Vapor – Small black clouds floating in the air near Kael'thas. If touched they add a stacking debuff which reduces max health by 10% each time, stacking up to 9 times, to 90% reduction. * Fireball: Hits for around 2-3k. ~6k damage in (not partially resistible). Can be interrupted and reflected. o Produce a short-range, high-damage explosion and knockback. o Spawn an egg that must also be destroyed or the phoenix will respawn. o Bounce to the ceiling when within a few yards of the floor. o "Swim" in the air. o Receive 300 Arcane damage per second (that is, 300 damage per second for 30 seconds, for a total of 9,000 damage). This is mitigated by a character's resilience, since it's considered a damage over time effect. Note that when Patch 2.4.3 is released, this will be lowered on normal mode, but this will be the same on heroic mode. * Shock Barrier: Absorbs 10k damage and grants immunity to interrupts. This spell begins the 4-second casting time of Pyroblast. * Pyroblast: ~55k damage before mitigation, cast on his current target 60 seconds after the fight started. Can only be interrupted after the Shock Barrier is destroyed. Cannot be reflected. Kael CAN cast Flamestrike while casting Pyroblast. It can be completely avoided by nuking him below 50% before 60 seconds have passed. Prince Kael'thas was a powerful mage and member of the Six, the shadowy high council of the Kirin Tor. Prior to the Second War, he and the other members of the high council questioned Khadgar about the orcs and the events in Karazhan that led to the death of Medivh. Compassionate and caring, Kael'thas spent most of his time in Dalaran. During the Third War, with the Scourge invasion of Quel'Thalas, he evacuated as many survivors as he could and burned many of the enchanted forests to spite the Scourge. He assumed command over the bulk of the surviving high elves (see the fall of Quel'Thalas and Splintering) and renamed his followers blood elves in homage to their murdered brethren. All he feels now is hatred for the undead that ravaged his homeland, rage for the Alliance he feels failed his people, desperation over his people's collective addiction to magic, and grief for his ravaged kingdom. As the last known surviving member of the Sunstrider dynasty, Kael'thas is the heir to the high elven crown but has yet to take it. Instead, he styles himself as the "Lord of the blood elves". He is proficient in siphoning magical energies from demons to feed his addiction and has taught his brethren to do the same. He salvaged the skull of his father, Anasterian, from the ruins of Quel'Thalas, enshrining it in Tempest Keep. The skull is among the artifacts that the red and green dragonflights would need to restore the Sunwell. In battle, Kael'thas naturally relies foremost on his magic. However, he is also a skilled swordsman and wields the Flamestrike sword, the ancient runeblade of the Sunstrider House that was first wielded by his ancestor, Dath'Remar. A wizard of great skill and power, Kael became a high-ranking member of the Kirin Tor. His continuing magical studies brought him to the Violet Citadel, where he met Lady Jaina Proudmoore while she was still an apprentice. He was immediately drawn to the brilliant and lovely teenager, though the difference between their ages filled him with guilt and self-doubt. Eventually he courted her; however, he had little success in winning her regard. She remained dedicated to her craft above all else. When rumors began to circulate that Jaina had given her heart to Prince Arthas Menethil, Kael'thas was deeply grieved. In time Jaina and Arthas parted ways, but it was all too obvious to Kael'thas that they still cherished feelings for one another. Kael'thas and Jaina would never have more than an awkward friendship. Following the destruction of Silvermoon, Kael began to notice an emptiness within himself and his brethren, an insatiable hunger and disharmony. However, there was no time to deal with that, as Kael had other duties. Kael and his soldiers were stationed in the Silverpine Forest when a disturbance began to rile up the undead in and around Dalaran. They had begun to raid the outposts Kael had established, so he gathered up his forces to seek refuge in the relative safety on the other side of the River Arevass. As he was loading the supply wagons, he was met by two unexpected strangers, Maiev Shadowsong and Tyrande Whisperwind. These night elves had pursued Illidan Stormrage for three days across the sea. Kael guessed that perhaps Illidan was behind the disturbances at Dalaran, and when he told them his tale, Tyrande immediately offered her assistance, thinking that he could help them track down Illidan. Maiev believed it to be a waste of time, but reluctantly agreed. With the protection of the night elves and their Mountain Giant allies, Kael quickly made his way to Pyrewood Village to retrieve his buried supply caches. As they gathered more reinforcements, Maiev asked Kael where the rest of his brethren were, and he told them of the destruction of Quel'Thalas. Tyrande empathized, but warned that vengeance and rage was not a pleasant road to walk. As they arrived in Pyrewood, the undead were lying in wait and ambushed the caravan. Kael, Maiev, Tyrande and their forces battled off the first attackers, but as the second wave advanced, they realized that the caravan would never survive another assault. Maiev and Kael rushed the caravan across the bridge, while Tyrande stayed to fend off the undead alone. As she called upon the powers of Elune to protect her, the bridge fell away, and Tyrande was swept down the river. Kael wanted to pursue her, but Maiev stopped him, saying that she was a warrior and knew the risks. Maiev then demanded that Kael honour their bargain, and help her capture Illidan. Kael and Maiev tracked Illidan to Dalaran, where Kael's scouts found him performing a strange ritual with a mysterious gem. Malfurion came and told them that Illidan's spell was using the Eye of Sargeras to break Northrend apart. Immediately, they advanced upon his location, while Kael defended their bases from the voracious undead. When Illidan's spell was interrupted, Malfurion approached his brother and condemned him for his part in Tyrande's death. Kael, perplexed, suggested that it was premature to assume she was dead, and was vehemently silenced by Maiev. Malfurion, realizing he had been duped, left Maiev entangled in vines while he and Illidan set off to save Tyrande. Maiev eventually freed herself and set off in pursuit, while Kael'thas was left in the ruins of Dalaran. Kael found the Grand Marshal Garithos at Dalaran, who dismissed his story of the night elves as a fanciful excuse. Garithos, Kael's commanding officer, harbored a poorly-hidden disdain for all non-human races. Garithos informed Kael that a strikeforce was encroaching on Dalaran, and that he was going to head them off at the mountains. Kael was quick to volunteer his assistance, but Garithos had other plans. He explained that a second force was believed to be approaching from the east, and that the arcane observatories needed repairs so that they could be used to spot them. Kael did as ordered, but when he came to Lordamere Lake, he found the shipyard ruined, and had no route across the water. Lady Vashj, a naga witch, soon arrived to offer her aid, citing their common ancestry. Vashj gave him boats, which Kael used to ferry his troops to the outlying observatories. When Garithos returned from the front, he condemned Kael for consorting with the naga, despite the prince's assurances that they were not a threat to the Alliance. Garithos warned Kael that he would not tolerate treason before leaving Kael to keep things in line at Dalaran. Garithos' Emissary soon arrived with further orders, reporting that the observatories had detected an undead force in the west. Kael was to defeat them, though the emissary also recalled his foot soldiers, cavalry, and support teams to the front lines. Kael was left with only his fellow elves to aid him, and the undead were quick to overtake the outposts across the river. Once again, Lady Vashj arrived with her naga, and though Kael was wary of accepting her offer, she insisted that without her help, he and his brethren would surely fall. Realizing that it would be impossible to survive without these reinforcements, Kael accepted. Together they defeated the undead. After the battle, Kael told Vashj about how his people felt an emptiness ever since Quel'thalas was destroyed. Vashj explained to Kael that just like the naga, his people were addicted to magic. Without the Sunwell to give them a constant supply of magical energies, they would surely suffer a fatal withdrawal. Kael heard Garithos approaching, and bid Vashj to flee, but Garithos' men saw the naga escaping and arrested Kael and his people for treason. Garithos smugly told Kael that he now had all the proof he needed to deal with him and the other elves as he felt they deserved, and he had them all imprisoned in the Dungeons of Dalaran. Vashj crept in through the sewers of the dungeons and freed Kael, then helped him free his brethren. Vashj promised him escape from his human oppressors through Kel'Thuzad's interdimensional portal, where her master, Illidan, was waiting on the other side. As they neared the exit, Kael met his former comrade, Jailor Kassan, who he was forced to slay in order to escape. Upon leaving the dungeons, the blood elves and naga fled through the portal Archimonde used to enter the world of Azeroth, and into a new world. Kael found himself on the barren lands of the Hellfire Peninsula, and Vashj revealed that this Outland was once the orcish homeland of Draenor. They searched for Illidan for days, until Vashj caught a familiar scent on the winds. Maiev had captured Illidan and was escorting him back to her base in a prison wagon. Kael and Vashj's forces quickly rushed into the fray and battled Maiev's army in order to retrieve the unconscious Illidan and return him to their base, where they could undo the magical lock that kept him caged. Illidan was pleased with the tenacity of all his servants, new and old alike, and told them of the situation in Outland. To flee from his vexed master, Kil'jaeden, Illidan had fled to Outland only to find it overrun by Magtheridon and his fel orcs, reinforced by demons arriving through Ner'zhul's dimensional gates. Kael had hoped Illidan might be able to cure the blood elves of their addiction to magic, and asked if he could help them. Illidan sadly told him that there was no cure for their condition, but promised Kael that if he joined him, he would provide the blood elves with enough magical energies to keep their hunger sated forever. Upon hearing this, Kael pledged his loyalty to Illidan. The blood elf Rommath was sent to spread Illidan's message of a new homeland to Quel'Thalas. Kael and Vashj protected Illidan as he went about closing the interdimensional gateways. Kael discovered a camp of draenei being assaulted by orcs, and lent them his aid. He was greeted by Akama, the Elder Sage, who offered his allegiance to Illidan. Finally, the time came to assault Magtheridon's Black Temple. Illidan, Kael, Vashj, and Akama all led their forces against Magtheridon's fortress, infiltrating it and finally defeating Magtheridon in his own throne room. As Illidan stood triumphant, Kil'jaeden descended from the fiery sky and rebuked Illidan for his insolence in trying to hide. The demon gave him one last chance to save himself - destroy the Frozen Throne, or face his eternal wrath. Kael and his new allies returned to Northrend, where they were immediately met by Anub'arak and his troublesome race. Though they kept them at bay, Illidan's forces slowly advanced on the Icecrown Glacier. Arthas soon arrived with his detachment of undead. Kael, who had known the prince in the time before the war, warned him that Illidan's forces were vast, and that Arthas would never make it to Icecrown in time to save the Lich King. When Arthas emerged from Azjol'Nerub, it was a race against time to reach the Frozen Throne before Illidan could. As Arthas and Illidan struggled to activate the obelisks surrounding the glacier, and open the gates into the Frozen Throne, Kael'thas and Lady Vashj did their best to interrupt Arthas in his struggle. Kael'thas and Arthas faced off against each other in combat several times, but Kael's forces were pushed back by the Scourge, and Arthas was able to activate all four obelisks. Arthas and Illidan met in single combat at the base of the glacier, just before the gates, now wide-open. After fierce combat, Arthas managed to get the best of Illidan, and Illidan's twitching body was tossed to the ground. Kael and Vashj were left leaderless on the snowy slopes of Icecrown as Arthas claimed his destiny. Together they took Illidan's unconscious body with them as they fled back to Outland. The remaining blood elves on Azeroth, now without support from the Alliance, are looking desperately to the Horde to help them reach Outland, where they can reunite with Kael'thas and achieve the golden destiny he promised them. After the Sundering ten thousand years earlier, Illidan had taken seven vials containing the waters of the Well of Eternity in order to create a new one at the top of Mt. Hyjal. Illidan used three to create the new Well of Eternity, but it was not known what happened to the other four until recently. It was revealed that Kael'thas received one of the vials, as did Vashj. In order to access the Battle of Mount Hyjal in the Caverns of Time, one had to complete a lengthy quest chain in Heroic mode in the other dungeons of Outland before creating the Tempest Key - the key to Kael'thas' inner sanctum. The players then had to defeat Kael'thas and take his Vial of Eternity. The access to Tempest Keep is now free and do not require the long chain quest, although players can still do it if they want. The Scryers discovered that Kael'thas had turned his back on Illidan and entered into an alliance with the Burning Legion. Kael'thas, aware of Illidan's insanity (brought on by his defeat at the hands of Arthas Menethil at Icecrown, nearly four years earlier), "switched paymasters accordingly", according to Magister Theledorn. Kael's decision to ally himself with the Burning Legion not only led him to betray Illidan, but also the Horde and his own people - the many blood elf pilgrims and adventurers traveling from Azeroth. At Manaforge Ara, agents of the Burning Legion bearing orders from Kael mingle with his Sunfury servitors. This also justifies how blood elf players are able to battle against Kael'thas in Tempest Keep. The Scryers, recognizing that Kael's mad bid for power will lead the blood elven race to doom, continue to fight against Kael'thas and his Sunfury fanatics in the hope of saving their people. This is the primary reason for the Scryers' defection. Kael'thas, though judged and seen as a madman, is merely a misguided leader, who will stop at nothing to save his people, even if that means the slaughter of his former followers, the (in his eyes) traitorous Scryers. Through spying on the Earthen Ring and their activities in Shadowmoon Valley, Kael'thas has gained the knowledge of the Cipher of Damnation. The Cipher of Damnation was used by Gul'dan to sunder the orcs' connection to the spirits of the land, and may have been the same (or similar) spell uttered by Thaurissan when he summoned the fiery destroyer Ragnaros to Azeroth. The time to strike at the remaining blood elves of Tempest Keep is now. Take arms and let A'dal's song of battle empower you! Kael'thas Sunstrider yells: Your monkeys failed to finish the job, naaru! Beaten but alive... The same mistake was not made when we took command of your vessel. Kael'thas Sunstrider yells: All for what? Trinkets? You are too late. The preparations have already begun. Soon the master will make his return. Kael'thas Sunstrider yells: And there is nothing you or that fool, Illidan, can do to stop me! You have both served me in your own right - unwittingly. Kael'thas Sunstrider yells: Lay down your arms and succumb to the might of Kil'jaeden! Despite his defeat in Tempest Keep, Kael'thas has survived the ordeal with the aid of Priestess Delrissa, and his plans remain unchanged. His appearance has changed, his skin sickly pale, and a crystal lodged in his chest after falling into a pit after his defeat in Tempest Keep. Having collected the necessary energies from his manaforges in Netherstorm, Kael'thas is returning to Quel'Thalas to reinvigorate the Sunwell - not as the source of his people's magic, but rather as the mystic portal that will allow him to summon his new master, Kil'jaeden, much as the Well of Eternity was used to summon Sargeras ten millennia before. 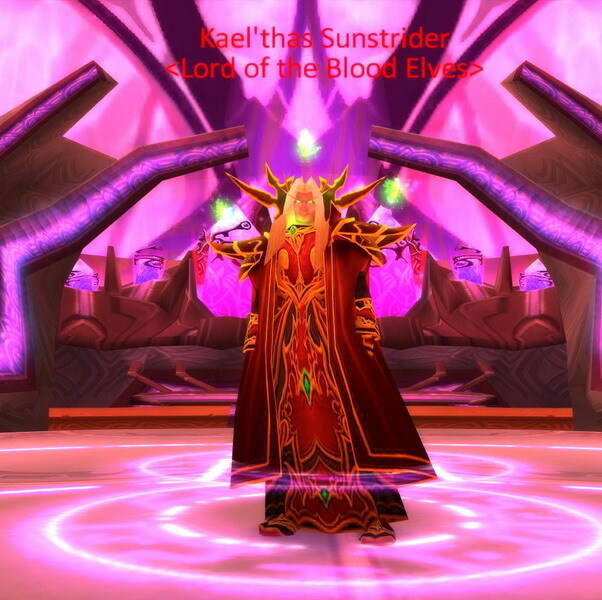 Kael'thas made his return as the final boss of the 5-man Magisters' Terrace dungeon on the Isle of Quel'Danas. Before settling in, he and his "felblood" minions assaulted Blood Knight headquarters in Silvermoon and captured the naaru M'uru, the source of the Blood Knights' holy magic, taking the weakened naaru to the Sunwell Plateau. This has led the Blood Knight Order and its leader, Lady Liadrin, to break off ties with the House of Sunstrider and swear allegiance to the Sha'tar and the Shattered Sun Offensive, in an effort to take revenge on the treacherous Prince.